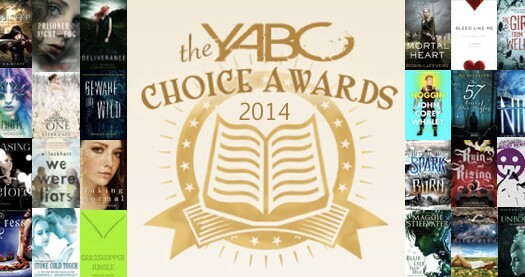 The 2014 YABC Choice Awards ~ Voting now open! Hello again YABCers! Welcome to our annual YABC Choice Awards! As always, here are the 2014 titles nominated by our in-house editors. These are our favorites of the year, the ones we couldn't put down, the ones with sequels we're dying to read, the ones that left us aching for more. Now we need you to narrow down our choices! Remember, only one vote per category per person, so make your choices count! But if you make a mistake or change your mind, you can always go back and edit your vote. Voting closes on January 15th, 2015! So get those votes in now! We can't wait to see the winners! FYI: This is powered by Google Docs. You must have a Google account to enter your vote, and you can only vote once. Because of high traffic volume on this page, the form might take a minute or so to load. If you are having trouble loading the form, click here. Also, if you are clicking through from Facebook, especially from a mobile device, Facebook's interface may not allow the form to load. Try accessing this page by pasting the link directly into a standard browser such as Chrome or Safari. The 2012 YABC Choice Awards - Vote for Your Faves! don't see a place to go and vote!!! It feels like some kind of travesty that Maggie Stiefvater isn't in the favorite teen author category!